Georgetown was originally settled in 1639 as a part of the town of Rowley by the Reverend Ezekiel Rogers. The town at the time stretched from the Atlantic coast to the Merrimack River, south of Newbury and north of Ipswich. Several farmers, finding suitable meadowlands in the western half of the settlement, began settling along the Penn Brook by the middle of the seventeenth century, creating Rowley's West Parish. Though not directly involved in King Philip's War, the village nonetheless did become a victim of Indian raids. The village, which became known as New Rowley, grew for many years, with small mills and eventually a shoe company opening up in the town. By 1838, the town was sufficiently large enough for its own incorporation, and was renamed Georgetown. Small industry continued, and today the town is mostly residential in nature, a distant suburb of Boston's North Shore. In the town, the population was spread out with 27.0% under the age of 18, 5.4% from 18 to 24, 23.4% from 25 to 44, 33.0% from 45 to 64, and 11.3% who were 65 years of age or older. The median age was 41.8 years. For every 100 females there were 97.5 males. For every 100 females age 18 and over, there were 93.8 males. Georgetown employs the open town meeting form of government, and is led by a board of selectmen and a town administrator. The current selectmen are C. David Surface (Chairman), Douglas Dawes, Steven Sadler, Joseph Bonavita, and Gary Fowler. Georgetown has its own police department, two fire stations (Central Station in downtown and Erie Station in the Northern sector of town), a post office, library, electric department and highway department. The nearest hospitals to the town are in Haverhill, Newburyport and Beverly. Georgetown Peabody Library is the town's only public library and named for the noted philanthropist George Peabody who provided the funds to build the library to honor his mother. Mr. Peabody provided the funds necessary for the building of the Peabody Institute Libraries in Danvers and Peabody, as well Georgetown (Washington, D.C.), Baltimore, Thetford, Vermont, Austin, Texas and others. He funded the establishment of the Peabody Museums at Harvard and Yale and in Salem. The Peabody Library recently finished an addition and renovation. Brian St. Pierre, former standout quarterback at St. John's Preparatory School and Boston College. He played in the NFL from 2003-2010 and is now the head coach at his high school alma-mater (St. John's). ^ "Profile of General Population and Housing Characteristics: 2010 Demographic Profile Data (DP-1): Georgetown town, Essex County, Massachusetts". U.S. Census Bureau, American Factfinder. Archived from the original on September 11, 2013. https://web.archive.org/web/20130911234518/http://factfinder2.census.gov. Retrieved August 31, 2012. ^ "Geographic Identifiers: 2010 Demographic Profile Data (G001): Georgetown town, Essex County, Massachusetts". U.S. Census Bureau, American Factfinder. Archived from the original on September 11, 2013. https://web.archive.org/web/20130911234518/http://factfinder2.census.gov. Retrieved August 31, 2012. ^ "American FactFinder". United States Census Bureau. 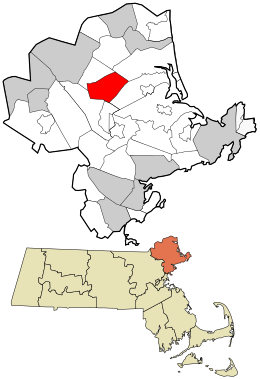 https://factfinder.census.gov/bkmk/cf/1.0/en/place/Georgetown%20town,%20Essex%20County,%20Massachusetts/POPULATION/DECENNIAL_CNT. Retrieved July 28, 2017. This page uses content from the English language Wikipedia. The original content was at Georgetown, Massachusetts. The list of authors can be seen in the page history. As with this Familypedia wiki, the content of Wikipedia is available under the Creative Commons License.